Ayampe is a paradise, a place filled with natural and serene beauty. A place barely touched, but still looks untouched. Ayampe is not just a small, surf town, but rather, Ayampe, is a place that brings together various bodies of water, sand, mountains, and the jungle all in a matter of kilometers. Ayampe is home to the ocean. It is home to the river. It is home to the lagoon. It is home to the jungle and bamboo filled mountains. It is home to the natural tide pools. It is home to a variety of bird, plant, and insect life. It is home to dolphins, whales, manta rays, and a variety of other fish and marine life. It is home to monkeys, wild horses, wild cats, iguanas, and a variety of other animal life. And what better way to experience all of the Mother Nature that Ayampe has to offer than experiencing the ultimate “See All of Ayampe” kayak trip organized by La Casa long-term hostel. Why do we call it the “See All of Ayampe” Kayak Trip? Because you literally get to see all of Ayampe. The adventure starts off at La Casa hostel with a 4×4 truck that takes you through the jungle to the mountains and, eventually, to the top of the Ayampe River where you will embark on your kayak adventure. The river’s downstream current is strong enough to simply float down the river or you can decide to enjoy more of an adrenaline adventure with stronger paddling. The river flows through the Ayampe Reserve, also known as, the Ayampe jungle. Here you will be gifted with 360 degree views of untouched, jungle filled mountains. Throughout the river journey, you will spot wild horses and, if you are lucky, monkeys and toucans as well! Kayaking through the river, proper, takes about 2-3 hours depending on how fast you decide to paddle. The river eventually leads you to the Ayampe Lagoon and then the Ayampe Lagoon drops you right into the Pacific Ocean with perfect views of the Ayampe Islotes! So in a matter of 3 hours you see the jungle, mountains, the river, the lagoon, and the ocean, which is why we call this the “See All of Ayampe” kayak trip!! If your goal is to see wildlife, then the early morning (around 5 am) is the best time to start. This increases your chances of spotting monkeys and toucans, plus it is beautiful to watch the sky change colors as the sun rises. If your goal is to arrive to Pacific Ocean in time for the sunset (this is absolutely beautiful and stunning, by the way), then it is best to start around 2 or 3 pm. Take advantage of the natural beauty that surrounds you. By this we mean, on the way down stop and have a picnic, swim, relax, rest, enjoy the music of the birds, and take your time floating down the river. While this is one of the most beautiful adventure trips that you can do in Ayampe, it actually can not be done all year long. In order to kayak down the Ayampe River, Ayampe must have a sufficient amount of rain to keep the river full. The most ideal conditions for this trip are after the rainy season or after a few weeks of rain. Additionally, to complete the entire trip, the river must be full enough to fill the lagoon and to connect the lagoon to the ocean. The best months for this kayaking trip are April, May, July, August, and September. If the conditions do not allow for the “See All of Ayampe” kayak trip, not to worry! 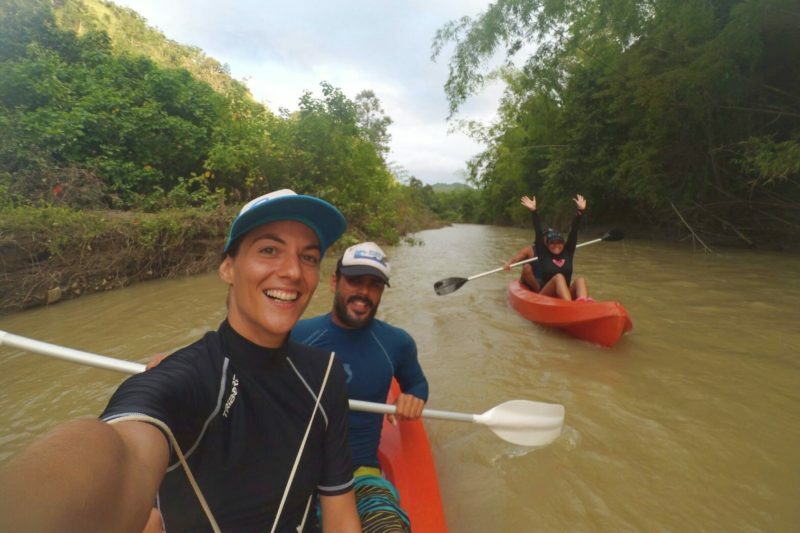 You can still kayak to the Ayampe Islotes where you can snorkel and see giant Ecuadorian manta rays or you can kayak in the Ayampe lagoon during sunset. Both of these are fun activities as well! If you take anything, take photos. If you leave anything, leave footprints. Together we can preserve our planet for generations to enjoy. Close contact form without sending. to book a stay at La Casa. La Casa is situated right on the beach of the small coastal town of Ayampe. Travelers from all over the world come to Ayampe to cultivate a community of peace, happiness, and mutual respect. The nearest international airport is in Guayaquil. From there, you can take a taxi or a bus to Ayampe. Take a bus either to Olon or Montanita. It is the CLP bus company (large brown/maroon buses) direct from the Guayaquil Bus Terminal. Take a green Manglaralto bus heading north. Ask the bus to stop at Ayampe. Ayampe is approximately 25 minutes away. Taxis from Montanita or Olon are around $15. Take the Reina Del Camino Bus directly to Puerto Lopez. Take a green Manglaralto bus heading south. Ask the bus to stop at Ayampe. Ayampe is approximately 15 minutes away. Taxis from Puerto Lopez are $5. The bus will let you off on the E15 by a small store. It is a five minute walk to La Casa from here. Walk straight towards the ocean. At the end of the road, La Casa is the large white three-story building directly on the corner.